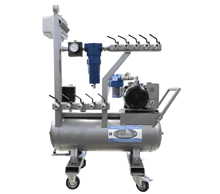 RTM vacuum systems for vacuum infusion (resin transfer moulding), specially designed for resin infusion applications. Resin vacuum infusion trap 24 lit. Vacuum infusion trap equipped with: a transparent Plexiglas cover, manual vacuum relief valve, manual vacuum pump insulation valve, vacuum gauge. Resin vacuum infusion trap 6,5 lit. Resin vacuum infusion trap 95 lit. 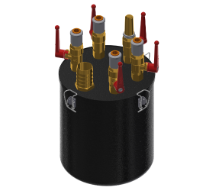 RTM vacuum system – 28 m3/hr. 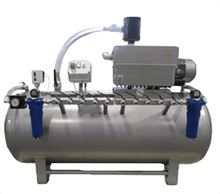 The vacuum pump is assembled directly to the steel tank to reduce clearance requirements. The vacuum pump is equipped with a safety suction filter, non-return valve and shut-off valve. The electrical power panel and controls guarantee maximum efficiency; the pump can be started only if requested, thus reducing energy consumption to a minimum. 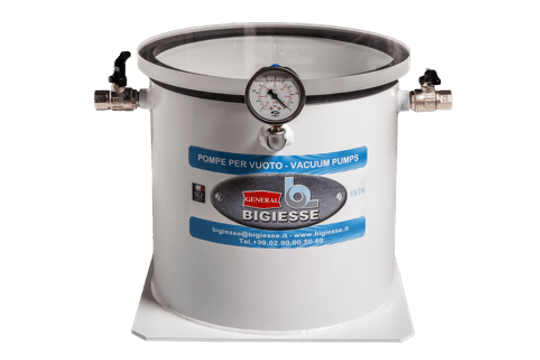 The tank features two vacuum outputs: the first output guarantees a maximum pump vacuum level, whereas the second output is equipped with a vacuum reducer for the final pressure adjustment and an active carbon filter. In addition, the tank is equipped with casters to facilitate displacements inside the production site. 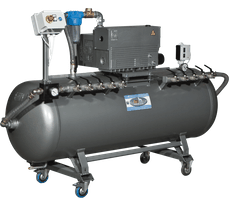 RTM dual tank vacuum system. 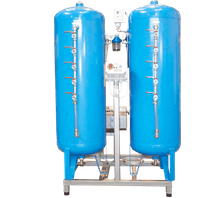 The vacuum pump is assembled onto a steel base, combined with two vertical tanks. The vacuum pump is equipped with a safety suction filter, non-return valve and shut-off valve. The electrical power panel and controls guarantee maximum efficiency; the pump can be started only if requested, thus reducing energy consumption to a minimum. 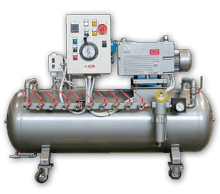 The first tank guarantees a maximum pump vacuum level, whereas the second tank is equipped with a vacuum reducer for the final pressure adjustment and an active carbon filter.